It's because you listed it under replacement parts and not machines? No, the other one is in that category too. I also don't see it when searching. I noticed this yesterday afternoon. 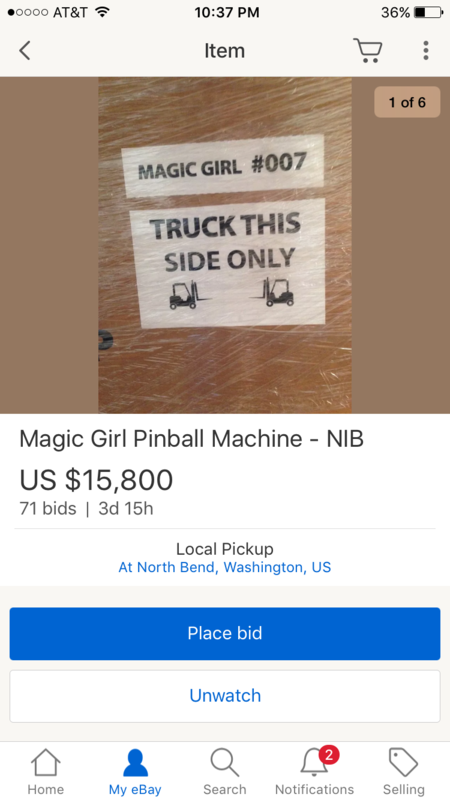 I had no problem finding it a couple days ago by searching "magic girl pinball". Yesterday and today it doesn't show up. Weird. Hope eBay can sort it out for you! Yeah - Just got off the phone with Ebay tech and they are stumped. I asked if the category could affect it but that isn't the issue - the item number itself cannot be recognized by their query software. They said 24-48 hours, wondering if bidding is frozen while they tinker. This thing may have to get re-listed after all - but for reasons no one in the contest could have ever speculated on. Seems almost poetic that MG managed to screw up even Ebay. 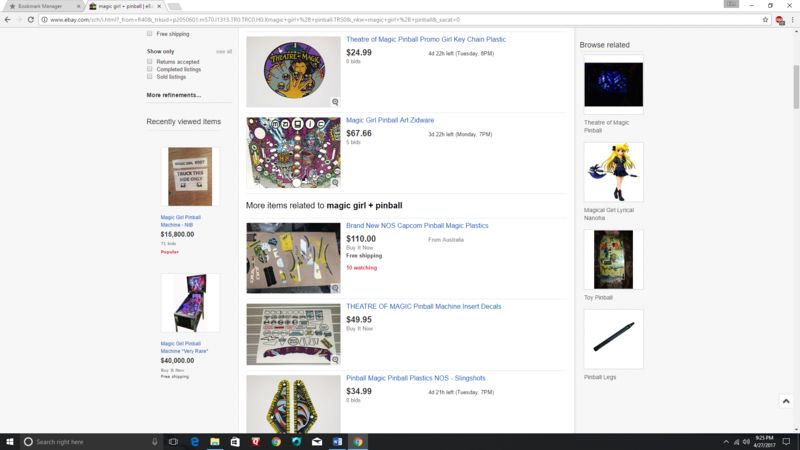 I have it on my eBay Watch List and when I go to that category, your ad is right there and shows active. I've done that a few times today and just now with no problems. But because of your post, I logged out of eBay and tested searching for it. Searching in this way your ad doesn't show in the main line up. 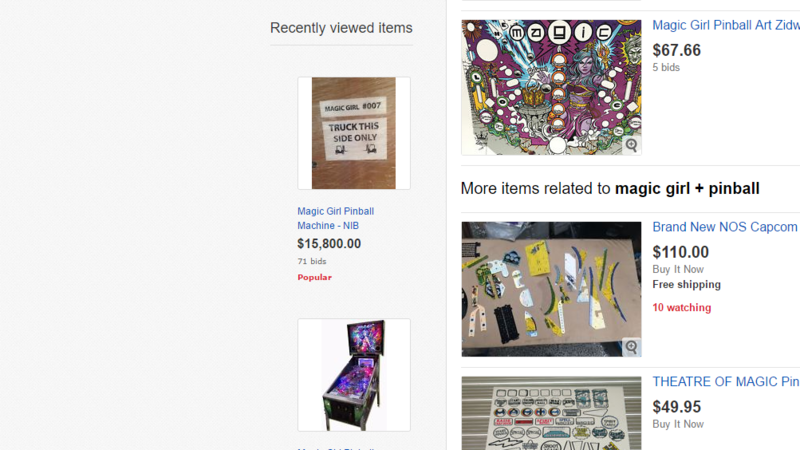 But off to the left side of the page (scroll down just a bit) it shows it under "Recently Viewed Items". 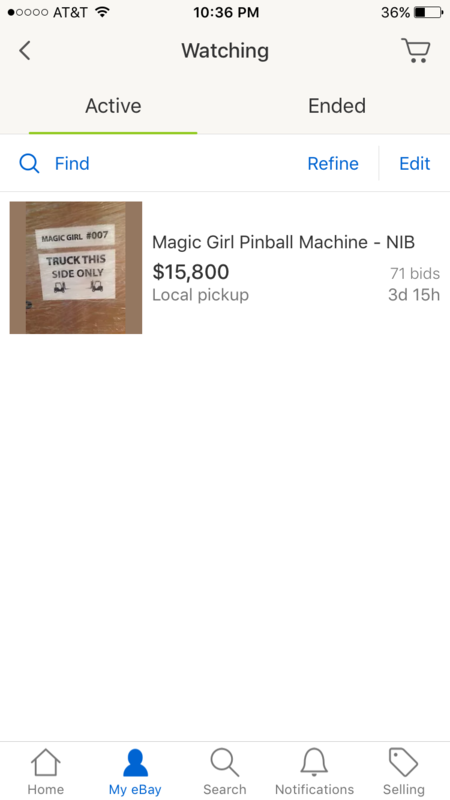 When I click on that, your listing comes up and again shows active. Here's a screen shot of what I'm talking about. Thanks Kim, I'm guessing that is cached. Listing is definitely dead to anyone who hasn't been before. Zidware, lightning bolts and all, strikes again! Ad is there and fine, it's just the search indexing is f'd up. Try editing it, especially the title, that might trigger a re-index. Obviously keep the key words, add some new ones. Or change title completely, and change it back later. There's lag time, so it may take a while, I forget how long (maybe 30-60 min max? ), but I've seen it happen before. Anyone know if it ever showed up by search? OK, listing goes live again at 7pm PDT tonight.... to assist the drunk bidder crowd (thanks for the tip Josh). I've already cleared a spot for my trophy. As a man that shaves his head every day, I say welcome to the club Dave King. So starting over? You need to end the auction around 11 pm anyhow for the drunken idiot bidding crowd. You really need to check out Nair or hot wax. Candy 3D Flipper Caps Mod Choose your Color!